There are certain human behaviors I will never understand. Take, for example, the practice in my neighborhood of putting the garbage cans out the evening before the garbage is to be picked up. I would understand this practice if the garbage men arrived early, but they don’t. They arrive after the school buses have picked up children and after most people have left for work. Their behavior results in raccoon, possums, dogs and who knows what else getting into the garbage and dragging it around the neighborhood. I had been puzzling about this “evening before garbage pickup” for a while, when someone pushed the envelope. 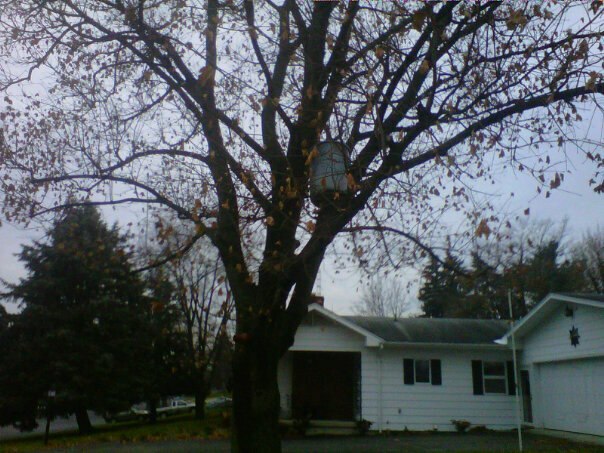 I was walking my dog near the park last year when I noticed a garbage can in a tree. There was no explanation, and the garbage can stayed there for weeks. I may never understand such situations, but they will always make me smile. Posted on November 20, 2013, in Family, My life, perspective and tagged 365 reasons to smile, garbage, human behavior, musings, People, perspective, smiles. Bookmark the permalink. 53 Comments.